Anyone who produces customized plastics machinery, as the company ENGEL does, must remain flexible at the same time as ensuring efficiency. The company, which has its headquarters in Austria, has succeeded in realizing higher productivity at the same time as higher flexibility by employing a combination of a machining center and a flexible manufacturing system – and this despite the rapidly growing diversity of parts and therefore of production down to a batch size of 1. ENGEL is the largest single-brand manufacturer of injection molding machines worldwide and one of the leading companies in the plastics machinery industry. “Our customers primarily originate in the automotive, packaging, medical technology and electronics industries. Furthermore, we also have a “Technical Molding” division, which is dedicated to technical injection molding of the type used for manufacturing toys, tool handles, chainsaw housings, or similar components”, explains Gerhard Stangl (Dipl.-Ing. ), head of the division of production of small and medium-sized machines at ENGEL AUSTRIA GmbH, located in Schwertberg near Linz. Injection molding machines with a clamping force of up to 500 tons are produced at the production plant. “We specialize in developing and producing machines in accordance with individual customer requirements. This has seen us gradually evolve into a system provider, meaning that we provide complete production cells from one source, which along with injection molding machines also encompasses automation and the logistic periphery, planning tooling projects and processing technologies. Against this backdrop, the complexity of component production has increased enormously as a result of the growing variation in parts”, as Gerhard Stangl explains. ENGEL has been able to benefit from a number of fundamental experiences in this field in the past. For example, in 2003, at the production plant in St. Valentin where large machines from 500 to 5,500 tons are built, two Heller MCH 280 type machining centers were purchased and linked up in a ­Fastems multi-level system (MLS-MD, MLS Medium Duty), producing a load capacity of 1.5 tons. “Our attention was drawn to the Fastems systems by the machinery manufacturers, so that two Heller MCH 550 machines, also used at the St. Valentin location, could be automated for the second system using this type of solution”, as Markus Steinbauer reports. Once ENGEL decided over the course of expanding its production capacities to invest in three machines of type StarragHeckert HEC1250 Athletic for the plant in Schwertberg as a replacement for older machine tools, linking up this machining center to a highly-automated system was the obvious way to proceed. As Gerhard Stangl says: “The focus of this investment was firmly on the machinery. We wanted to use the chance to integrate the latest tooling technology into production. We tend to consider automation to be peripheral equipment, and we therefore also arrived at the Fastems systems via StarragHeckert, due to our specific requirements for this project. The machining center was delivered in mid-2010. Just four weeks beforehand, the multi-level system of type XHD, with a 7.6-ton load capacity, was installed and prepared for interlinking the machinery, whereby the loading stations were set up parallel to installation of the machines. “The installation of the overall system took around six months. Nevertheless, we were able to launch production using the first machining center very quickly, gaining our first experience with the system in the process. However, comprehensive groundwork was necessary prior to installing the complete automation system, because we unconditionally wanted to have a system with two levels. While the MLS has an overall height of six meters, the height of the hall is around 4.5 meters, and so we had to lower the floor. For the workers on the systems, this results in the advantage of having ergonomically better access to both the machines as well as the system’s loading and unloading stations”, as Markus Steinbauer explains. 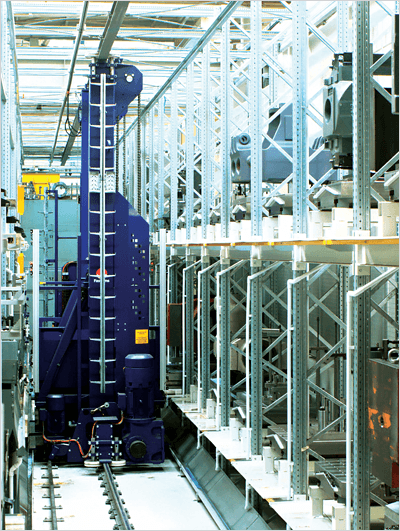 The MLS from Fastems extends over a length of 45 meters, whereby the two system levels provide room for 58 machining pallets (1,250 x 1,000 mm). “The basic pallets are always the same. However, due to the distortion contours of the workpieces, we require four different dimensions for the pallet places, which did not however end up being a big problem using this solution”, Gerhard Stangl says. The clamping devices for the system were developed by the in-house engineering department. “We do a lot of mechanical clamping. Because of the large diversity among parts, we have many billets which feature varying workpiece widths and heights. We have therefore paid special attention to being able to clamp these parts using the appropriate modules, for example special sliding elements. This allows us to keep the corresponding basic fixtures flexible, and the number of fixtures we require therefore remains very manageable” as Gerhard Stangl says. Gerhard Stangl (Dipl.-Ing. ), head of the division of production of compact and medium-sized machines (on the left) and Markus Steinbauer (Dipl.-Ing, FH), production manager, at ENGEL AUSTRIA GmbH.